I’m here! I’m here! And, I come bearing recipes. Yes, it’s CSA time, and I know there’s a bunch of you peering into your box, wondering what to do with garlic scapes and that crazy kohlrabi. Of course, it’s still early in the season, so we’ve also been working our way through lots of lettuces and greens. For the salads, these pickled onions are working out really well. With the cilantro that’s come, we had a dressing from one of Gwyneth Paltrow’s cookbooks (I borrowed it from the library) that had me whirling the herb up with some yogurt, green garlic, also from the CSA, scallions, jalapeno and fresh lime juice. I used the rest of the cilantro tonight in this rice. Good stuff. As for those aforementioned kohlrabi and scapes, I drew inspiration from an extraordinary meal Rich and I had at Ribelle last week to celebrate Father’s Day and his birthday. (I chose the restaurant and just asked him to trust me.) One of the dishes I had featured both kohlrabi and pickled garlic scapes. It was really terrific, and I plan on pickling the scapes in my crisper in the next day or two. 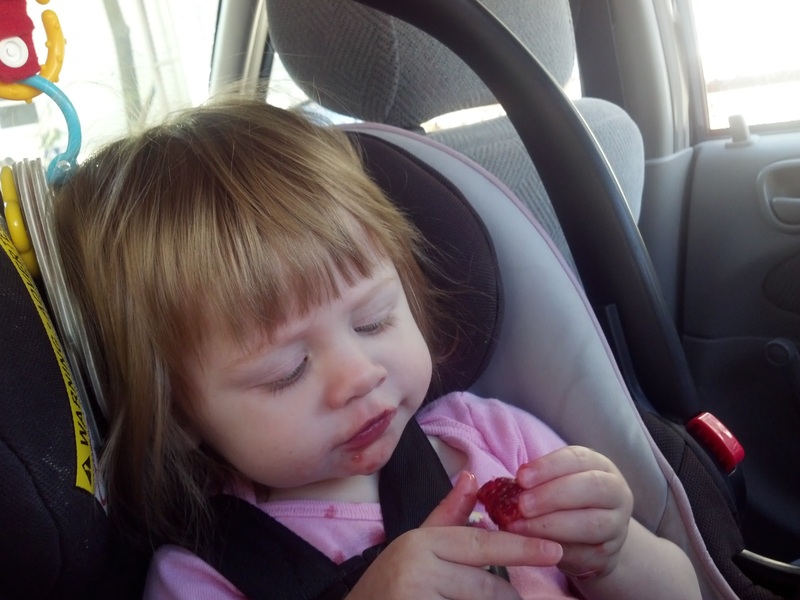 We did a separate fruit CSA this year, which was smart because Lilli basically eats her weight in strawberries daily. I was able to wrestle a few of the berries away from her and tossed those with some maple syrup and roasted them in a hot oven for about 20 minutes. Feel free to swirl those into some plain yogurt. Rich was skeptical about a recipe that called for alfalfa sprouts like this one does, but he had thirds. Thirds! I had white pepper in the house from this hot and sour soup. I think dried cranberries will work as a substitute for the dried whole sour cherries, and will make this recipe very affordable in case you don’t have a surplus from your local Ocean State Job Lot. It turns out a friend of mine from college also just made this, and they added fresh fennel and its fronds to their salad which sounds like a great addition. If you have it, go for it. 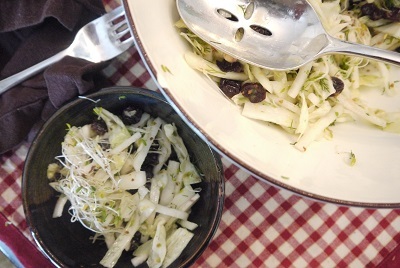 Peel the kohlrabi and cut into thick matchsticks that are about ¼ inch wide and 2 inches long. Cut the cabbage into 1/4-in-thick strips. Put all the ingredients, apart from the alfalfa sprouts, in a large mixing bowl. Use your hands to massage everything together for about a minute so the flavors mix and the lemon can soften the cabbage and the cherries. Let the salad sit for about 10 minutes. Add most of the alfalfa sprouts and mix well again with your hands. Taste and adjust the seasoning; you’ll need a fair amount of salt to counteract the lemon. About two days before my birthday this year, Sylvie popped up online. “Do you already own this cookbook?” she asked, sending me a link. I told her I didn’t but that it looked promising. She was pleased and apologized for being so blunt. The next day, the cookbook arrived. The Passover recipes – more than 45, the front cover boasted – looked great. Literally — I must have flipped to the recipe for the lemon tart with basil nut crust and gazed at the photo every night for about a week. Alas, the recipe called for a candy thermometer, and I didn’t own one that is kosher for Passover. Also, I don’t have time to stir a lemon cream for 30 minutes. Maybe when Lilli is 6. But while I had the cookbook out, I figured it made sense to check out the Shavuot recipes, as that was the next holiday to think about. 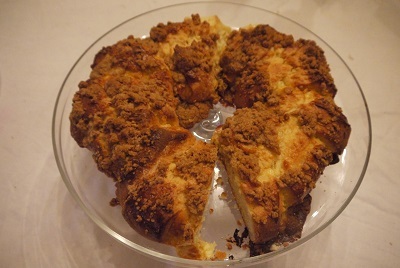 I settled on the cheese babka, and then promptly forgot about it until last week, when I started poking around my cookbooks for cheesecake recipes. You’ll be pleased to know I remembered this recipe in time, and, actually put it together this morning while Lilli and I hung out. If I’m going to be up before 6AM on a Sunday, I might as well get a babka out of it. Now, you’re probably wondering, if she doesn’t have time for a lemon tart, why would she make a babka, which calls for yeast? I’ve discovered that yeasted things are actually a safe bet because it’s just a matter of putting together a dough and then literally walking away for at least an hour to do what needs to be done. 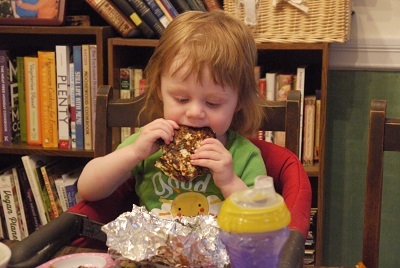 In our house, that probably means watching Cookie Monster on Youtube. I have to say, this recipe is flawed. Things like what sort of pan to bake the pastry on were flat out missing from the instructions. As I tested the recipe I kept thinking I wasn’t going to actually end up talking about it. But then I removed a golden ring of light, sweet pastry from the oven and all was forgiven. I’m posting this up tonight in hopes you’ll get a chance to make it in time for the start of Shavuot on Tuesday night. I had everything already in the house. I hope you do too. A few things about the recipe: My dough did not rise after 45 minutes so I turned my oven on to 275F and placed the metal bowl on top of the stove for another 45 minutes. If it had been winter, I would have just put it over the heating grate; that always works. My cream cheese filling did not come together the way it was supposed to, but I’ve had that problem before when baking with cream cheese. I ended up putting the wet mess of cheese in the freezer while I made the topping and the dough continued to rise. But the results were great, and I’m sure your cream cheese mixture will be just fine. Heat the milk over the stovetop or in a microwave oven until warm, not boiling. Pour the milk into a large mixing bowl or the bowl of a stand mixer. Add the yeast and 1 teaspoon sugar and let the mixture sit for 10 minutes, until thick. Add the remaining ¼ cup (50g) sugar, 2 ½ cups (315g) flour, butter, and egg plus one white. Combine the ingredients with a wooden spoon or with a dough hook in a stand mixer on low speed until they are all mixed together. If the dough sticks to the bowl, add the additional tablespoon of flour and mix it in; the dough should come together into a ball. Cover the bowl with plastic and let the dough rise for one hour. MEANWHILE, remove the cream cheese from the fridge and put it in a medium bowl. Let the cream cheese soften for 45 minutes. Add the sugar, egg, and vanilla and combine using an electric mixer. (I moved the dough to another large metal bowl, washed the mixing bowl and used it for this part of the recipe.) Cover and place in the fridge until the dough is ready. MIX THE FLOUR , brown sugar, and cinnamon together in a medium bowl. Add the butter and rub the mixture between your fingers until you have small clumps. Set the bowl aside. PREHEAT OVEN to 375F (190C). Sprinkle a 12×14-inch (30×36-cm) piece of parchment paper with flour. Roll the dough on top of the parchment paper until you have a 12×14 inch (30×36-cn) rectangle. Sprinkle more flour on the parchment paper if the dough sticks to the rolling pin. Remove the filling from the fridge and use a silicone spatula to spread it evenly over the dough. Roll the dough up the long way. Bring the ends together into a large ring, and press them together. Use a sharp knife to make cuts in the dough, every inch or so, on the outside of the ring, but cut only about three-quarters of the way into the ring, not all the way through. After you have made all the cuts, pull the slices apart slightly and turn each one so the swirl part is facing the next slice, partly facing up. Repeat all the way around. The recipe falters here, but I moved the ring to large rimmed baking sheet covered with a silpat liner. If you can manage to get that piece of parchment paper you’re working on on to a rimmed baking sheet that will also work. BRUSH THE DOUGH all over with the remaining egg yolk mixed with a teaspoon of water. Sprinkle with the crumbs. Bake for 35 minutes or until golden. Let it cool for about 20 minutes. Store covered at room temperature for up to three days or freeze for up to three months. Reheat to serve.